CONTENTS 4) EASY BLOG TOPICS FOR YOUR REAL ESTATE BLOG 6) BUSINESS GROWTH HACK: ABSORB YOUR CLIENTS’ STRESS! answer a hundred, if not thousands of times— that’s your pillar content. Wouldn’t it be nice if you could direct your clients to a blog post or, better yet, they discovered the answer on your website rather than you having to constantly repeat yourself? Or maybe you helped a client sell their house for much more than they were expecting by conducting a series of small and inexpensive renovations. Tell your readers how you did it. Your clients are likely new to the area. Inform them about upcoming community events or mom-and-pop shops they may have never heard of. Are there hiking trails or parks nearby? What’s the best place to grab a cup of coffee before work or a beer after? You can spotlight these places regularly as a monthly series. This should really make up the bulk of your content. The possibilities are endless, and you could easily come up with an entire year’s worth of content with only a few hours of brainstorming. 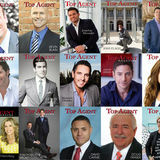 Here are some examples: You could provide your readers with a list of questions they should ask when interviewing a realtor, the steps to becoming a real estate investor, real estate facts all first-time homeowners should know, steps new parents should take to prepare their home for a baby, recommended vendors for home maintenance, or common real estate terms defined. You could explain to your readers what they need to know about home staging, which home renovations add the most value to their home, how to research schools or crime rates in specific neighborhoods, what a home association is, or how to start flipping houses and buying foreclosures. There are plenty of real estate news outlets that will be posting about the state of the market—but they won’t be talking about your specific community, and that’s where your blog comes in. Of course, if you only blog about community functions or properties on the market, then as soon as that event is over or that listing is sold, your content ceases being useful. The best real estate blogs balance their content by posting a little about all the above. Maintaining a high-quality blog means your prospective clients don’t need to visit several websites to have their questions answered because you’ve done the work for them. It’s a tool that helps you make a great first impression. If you still need help coming up with blog topics for your real estate blog, consider sending a survey out to your clients. You can send it via email and post it on social media. Ask your clients what real estate problems they need help solving and write your content with their responses in mind. When asked what he enjoys most about what he does, Derek’s answer is unsurprisingly not about the commission, but rather about the flexibility of his job and the opportunity to serve his clients. “I love the challenge,” he enthuses. “I love that every day is different. what I do, so when I am working it doesn’t feel like work.” Looking to the future, Derek’s plan is to continue building his business, team, and refining his already-exceptional approach to client service. “We’re constantly striving to improve the client experience and client satisfaction,” he says. 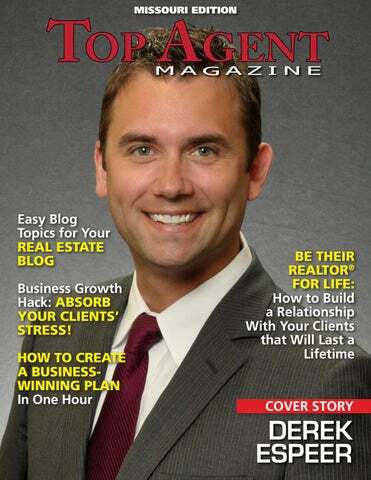 on being featured for the state of Missouri in Top Agent Magazine! Kansas City Office: 5819 NW Barry Road Kansas City, MO 64154 (816) 897-2211 (O) BHHSstein.com astein@BHHSstein.com www. ASSURED INSPECTIONS Gary Usry | 816 - 560 - 6010 assuredinspectionskc.com www.